quick, easy and delicious south indian style dry chickpea curry. rinse and then soak 1 cup of chickpea/chole with enough water covering them overnight or for 8 to 9 hours. in the morning discard the water. rinse the chickpeas in water. then add the soaked chickpeas with 4 cups of water in the pressure cooker. pressure cook the chole for 18 to 20 whistles or till they are cooked completely. the chana should be cooked well and should be soft when you mash it between your fingers or a spoon. if you do not have a pressure cooker, then cook the chickpeas in a pot with enough water. cooking chickpeas in a pot will take more time. once chole are cooked then drain the water and place boiled chole aside. heat oil in a pan, add the sliced onions. add 1.5 teaspoons of ginger-garlic paste and a pinch of asofoetida/hing. also add 1 to 2 slit green chilies. saute on low flame for a minute, till the raw smell from the ginger - garlic paste disappears. even the onions color would change to pale brown. add 1 tablespoon of chopped coriander leaves. sprinkle 1.5 teaspoons of black pepper powder and black salt as required. stir well. now add the boiled chole. stir well. add 1 teaspoon of lime juice and mix well. cover with a lid and simmer chana curry for 2 to 3 mins on low heat. remove the lid and switch off the gas. 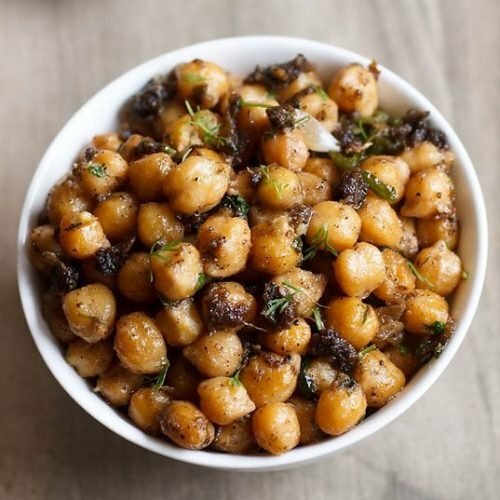 garnish the chole with 1 tablespoon chopped coriander leaves and 8 to 10 mint leaves. serve dry chole with hot phulkas, paratha or as a side dish with pulao or biryani. 1. if you want chole to be more spicy, then add more green chilies.